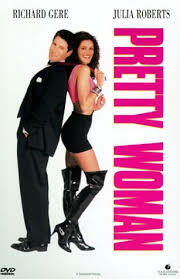 Pretty Woman celebrates 25 years since it’s 1990 release. Pretty Woman celebrated its 25th anniversary this week while remaining one of the highest grossing romantic comedies of all time. The 1990 film starred Richard Gere and a then unknown Julia Roberts. The movie skyrocketed her career, was nominated for an Academy Award and is one of my favorite movies of all time. As the cast reunited to celebrate the film’s silver anniversary, new revelations have also come out. The film is popular internationally and has had more ticket sales in the U.S. then any other romantic comedy, making approximately $463.4 million world wide. The movie was so popular it led to a reunion between Richard Gere, Julia Roberts, Director Garry Marshall and actor Hector Elizondo in the hit movie Runaway Bride. Pretty Woman is the ultimate Cinderella story about a prostitute named Vivian (Roberts) falling in love with an uptight businessman named Edward (Gere) after he hires her to be his date for a week. However, the film that audiences have come to love almost never happened. During a sit down interview with the Today Show, Marshall revealed that the original script was a dark dramatic tale about drug addiction. The dark version was titled 3,000 based on the salary provided to Vivian her services. In the tale, Kit (Laura San Giamaco) died of a drug overdose and the movie ended with Edward tossing money on the body of the drug addicted Vivian. However, when Marshall came on as director, the plot of the movie was completely changed and emerged as the beloved classic. When the plot changed, Roberts spent a couple of weeks thinking that she was actually out of a job. She had been contacted and told the original movie she was hired to do no longer existed. She then had to re audition and screen test for the new role. After Roberts was on board, she and Marshall faced the hard task of convincing Gere. Richard Gere had been told about the project, but after reading the script he was not interested in taking on the part of Edward. Undeterred, Marshall brought a 21-year-old Roberts to meet him at his New York Apartment. During their Today Show interview, Gere shared that is what convinced him to star in the film. Marshall left the two alone and there was immediate chemistry. However, Gere was still not convinced about the project until he received a call asking if he was in and Roberts slid him a post-it-note reading “please say yes”. Richard Gere signed on right then to play businessman Edward Lewis and audiences everywhere asked Pretty Woman to say it’d stay.